World of Warcraft expansion delayed until Jan.
World of Warcraft maker Blizzard has released its second application for the iPhone — World of Warcraft Mobile Armory. It’s free for download from the App Store. 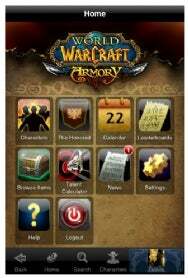 Designed as a complement to its World of Warcraft massively multiplayer online game, WoW Mobile Armory helps you keep track of your World of Warcraft characters. You can also use it to plan your adventures and keep up with the activities of your guild, similar to the World of Warcraft Armory Web site operated by Blizzard. You can use the WoW Mobile Armory app to look at your in-game calendar, check the leader board, access a “talent calculator” that helps you decide how best to level up the skills on your character, and to stay up-to-date on the latest World of Warcraft news. WoW Mobile Armory operates on any iPhone or iPod touch running iPhone OS 2.2 or later.